The T-Shirts are professionally Screen Printed, not iron on, or iron transfers. I hate when I get a t-shirt and after a couple washes the iron on starts peeling off, not this one! I’ve washed the Hater shirt several times and looks brand new. I get people asking about the shirt all the time, mostly what they say is…hey I saw that on Facebook. Oscar the Grouch is the perfect cartoon for this shirt! They use soft preshrunk 100% cotton shirts with double-needle stitching throughout and a seamless rib at neck. All of Five Finger Tee are available in assorted styles, sizes & colors. Orders usually ship from our store within 1 to 2 business days. (Please allow 5-7 days delivery for hoodies). Plus FREE SHIPPING for all orders over $50! (U.S. orders only). Dad will love this shirt or the many on tees on Five Fingers Tee. A Fast-Paced Bluffing Game is just what this family needs. 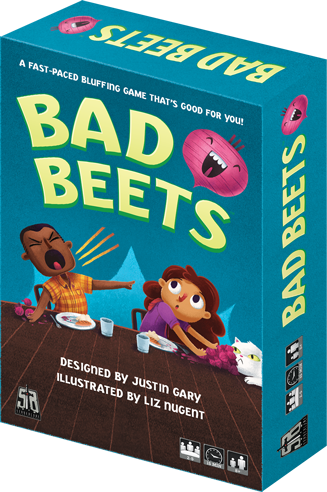 Designed for 2 to 5 players, ages eight and up, Bad Beets is a race for players to get rid of their Beets in any way they can, whether by Feeding the Dog, Sharing with another player or even actually Eating them. Players can try to get rid of their Beets however they want, but if another player calls them out, they can only dispose of their Beets if they have the right card in their hand. We are able to bring this game in the car and have fun during our road trips. This game has been in our Family Game Night rotation. Dad loves playing this game with the kids. He laughs more than the kids. Check out more about Bad Beets card game and get DAD a game to play with the kids. Guys like bluffing, right! The FriXion Clicker Erasable pen, are a great addition to any stocking allowing the recipient to write smoothly and erase cleanly without messy eraser crumbs. The ultimate pen for the ultimate overachiever, Pilot’s G2 gel ink pen is America’s no. 1 selling gel ink pen that provides long-lasting performance — perfect for writing a mailbox full of holiday cards. Available in 15 ink colors and various barrel designs so you can make your holiday season cheerful and bright! Perfect for business people, graduates, and pen lovers, Pilot’s MR Animal line provides a touch of class to any writing experience. It’s classic brass barrel, stainless steel. My husband is an artist and loves pens! He carries one on him at all times. Pilot pens are his favorite too. Colored pens he can draw with and highlight his pencil drawings he does. My daughter, well she totally claimed the G2 Gel pens. I was so impressed with the MR Animal pen, I used it for my Christmas cards and it wrote so smoothly. Everyone uses pens so might as well get them the best…Pilot Pens! Check out Pilot Pens and see what gift you will get DAD this year!